If you haven't started already, it's about the time now that most people start thinking more about Christmas! When you think Christmas, what comes to mind- the lights? the presents? the trees? the shopping? Santa? Hopefully, somewhere in that long list of all things Christmas, you stop a minute to think about the true reason for the season- the birth of Jesus! With all the craziness, sometimes that can get a little lost in the shuffle. As a mom, this is something I do not want! I want my son, once he has the ability to understand, to know that while the presents are nice, and Santa is fun, its truly NOT what the day is all about! I like to have little reminders of God's love throughout my home through the year, but no time during the year is that more important than at Christmas time. So what better place to turn to then Dayspring!? When I saw the Love Came Down Collection, I was immediately in love! In fact, before this review opportunity came along, I'd actually already purchased the card holder from this collection. Not only are the items absolutely GORGEOUS, but the message is beautiful. Never have I heard a song that so fully explains the importance of this season. It is not merely a story of a child born in a manger to a virgin mother. As a child, I heard that story over and over, as I'm sure we all do, and while I knew that was important, it wasn't until I was older that I truly grasped just how important that was. This child was born for the sole purpose of giving us an eternal life. For saving each of us. He was born to suffer and be crucified for each and every one of us. Words cannot express that type of love. Love came down...it certainly is the truth! There is no greater love in the world. This holiday season, I aim to share this message with the world. Through my words, through my actions and through my home, decorated with a purpose. 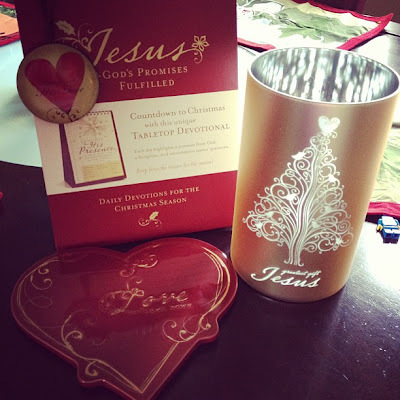 As part of the November Inspired Deals, Dayspring generously sent me the lovely Frosted Glass Hurricane and Trivet pictured below (as well as a few extra surprises like a stunning ornament and family devotional-which you can get right now for $5.99!). I could tell you all about these wonderful items, but this post is truly more about the message behind them than the actual items themselves. Brighten your Christmas décor with this beautiful, inspirational frosted glass hurricane from the Love Came Down Collection. Christmas Sale - SAVE over 35% This beautiful, Love Came Down Collection trivet brings to mind the real reason for celebrating Christmas - Jesus. Disclaimer: I received the products mentioned above from Dayspring in exchange for this honest review. All thoughts and opinions are my own. This post contains affiliate links. Honestly, I'm not sure I do a great job at keeping the true meaning of Christmas at the forefront. I know the true meaning in my heart and think about Jesus' birth often during the season. Christian Christmas music helps me further reflect. As Holden gets older, I hope to do lots of activities with him that will teach him the true meaning and really grasp it. I love their great cloth wreath! I try and thank God every chance I get for sending His son to die for us on the cross! I love the Love Came Down - No Greater Love - Soup Tureen & Bowls Set. I think it is so beautiful and a wonderful way to share the Gospel with a friend over a meal. We are really adament about doing advent this year. I think it will help keep the focus on Him this year. Also, we limit our gifts to our children to three. Every Christmas our five children receive three gifts: one “gold” gift, the big item they are longing for; one “myrrh” gift, which is for their body, such as clothing; and one “frankincense” gift, for their spiritual growth.